A bus powered by cow manure has set a land speed record for a regular bus by driving at 77mph. Reading Buses' "Bus Hound" (image here from the company), was recorded doing a lap speed of 76.785mph (123.57km/h) at Bedford's Millbrook Proving Ground. 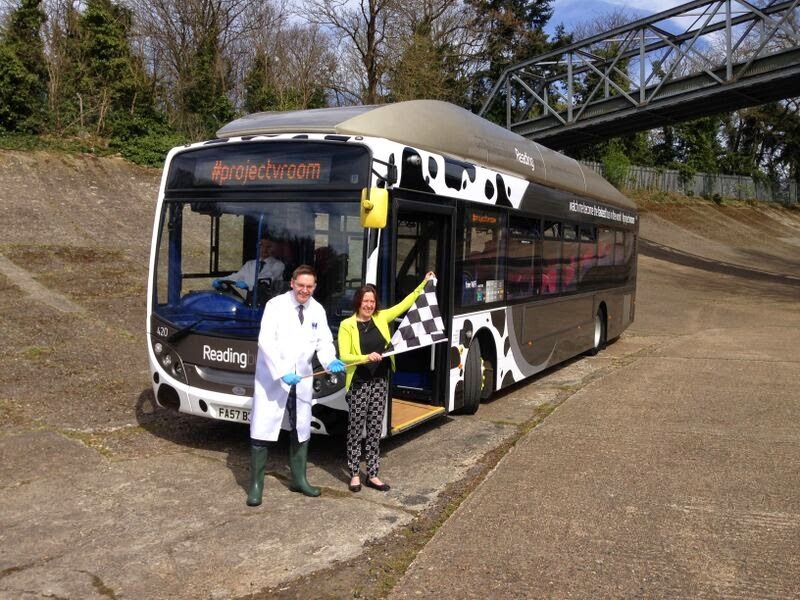 It runs on biomethane compressed natural gas and is painted black and white like a Friesian cow. It normally carries passengers around Reading. The UK Timing Association confirmed the new record. Trevor Duckworth, the association's chief timekeeper, said this was the first time a bus had been on Millbrook Proving Ground and described it as "quite a sight". The bus is normally speed limited to 56mph (90km/h). Martijn Gilbert, chief executive of Reading Buses, said it would not be recognised as a Guinness World Record unless it reached speeds above 150mph (241km/h). "Most importantly we wanted to get the image of bus transport away from being dirty, smelly, and slow. We're modern, fast, and at the cutting edge of innovation. "It was an impressive sight as it swept by on the track. It sounded like a Vulcan bomber - the aerodynamics aren't designed for going 80mph." Its fuel is made from animal waste which is broken down in a process called anaerobic digestion to produce biogas, which is then liquefied, Mr Gilbert said. It is stored in seven tanks fixed inside the roof of the bus. The vehicle's name was inspired by the British Bloodhound super-sonic car which aims to go beyond 1,000mph in 2016.